We’re changing our name today to reflect something that’s been happening for some time – the gradual evolution of Grubsheet from a general commentary site to one specialising in the Pacific and especially Fiji. In one sense, it was inevitable simply because that’s where our own interests lie. But we were also keen to add more grunt to the efforts of others – especially the distinguished New Zealand academic blogger, Crosbie Walsh – to present a more balanced view of events in Fiji as opposed to the deluge of anti-regime propaganda that emanates from several web outlets, in particular the main anti-government website, Coup 4.5. It’s precisely two years to the scheduled election in Fiji in 2014 that will herald a return to democratic rule. And as recent events have shown, there’s ample room for a more concerted attempt to hold the Bainimarama Government’s opponents to account for the more contentious aspects of their policies. It simply isn’t acceptable in the New Fiji – in our opinion – for anyone to advocate a Christian state, iTaukei as the sole official language, to reserve the term Fijian for indigenous people, reverse the policy of dual citizenship and remove the constitutional rights of anyone and especially on the grounds of sexual orientation. Grubsheet Feejee isn’t uncritical of government and we will point out where it errs. But we strongly support its multiracial agenda and its desire to promote solid economic growth through inclusive policies at home and investment-friendly policies abroad. We believe that Fiji needs a strong centre-right government with a keen social conscience. And that as things stand, Frank Bainimarama is best placed to deliver racial and social harmony and jobs growth. The principles he’s enunciated are certainly head and shoulders above those of his opponents – a common and equal citizenry, a secular state, the removal of systemic corruption, an independent judiciary , the elimination of discrimination, good and transparent governance, social justice, equal votes of equal value, the elimination of ethnic voting, proportional representation and lowering the voting age from 21 to 18. In one of Grubsheet’s favourite novels – the famous journalistic parody Scoop by Evelyn Waugh – the media baron Lord Copper explains that his Daily Beast “stands for strong mutually antagonistic governments everywhere”. How odd it is that in Fiji’s case, the strong antagonism has come from its larger neighbours – Australia and New Zealand – while Fiji strives to be a “friend to all”. And especially when it strives to entrench equality and fairness as opposed to the racism and bigotry of the previous government that Australia and NZ supported. We have long tried to tell the flip side of the constant “dictator bad, democrat good” narrative that is still the staple of the Australian and NZ media. That whatever its faults, the Bainimarama government’s one shining achievement is to give all Fijians a sense of belonging for the first time. We believe that whatever their range of views, hundreds of thousands of Fiji citizens and former citizens share our belief in the principle of equality of opportunity for all. They also share our vision that the Feejee of old – the one marked by savagery and primitive intolerance – can give way to a thriving, modern Pacific nation that’s a beacon to its neighbours and a country fit for the heroes all around us. These are those hardworking – and long suffering – ordinary men and women in Fiji who dream of a better life for themselves and their children. With sufficient resolve and goodwill, we passionately believe that dream will one day be realised. 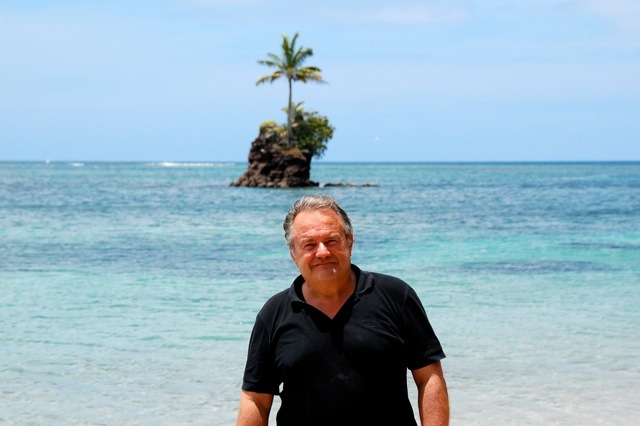 Good on you on the Fiji Focus….look forward to more upbuilding and thought provoking articles on Fiji soon…! Keep plugging away, Graham. We, the silent majority, support you, your efforts, and that of those like you. If we ever catch up, I will identify myself to you. I am in Sydney. A case of mistaken identity, “Beachcomber”. GrubsSTREET (as in the 18th century London thoroughfare peopled by literary types )was the business, GrubSHEET ( as in publication), the blog. Spotting the difference evidently requires more attention to detail than a regime critic like you possesses. Bula boss Graham,, please keep up with the good work!! Regards to all people from Labasa and Vanua Levu as they are always forgotton lot by all Feejee goverment!! Vanua Levu forgotten by Fiji government? What about the government’s ‘Look North’ policy – bauxtite mining in Bua, new port of entry being built at Middle Point (Naduri), tarsealing of Labasa -Nabouwalu road, same too with the Hibiscus Highway in Savusavu, rural eletrification vide Hydro projects in Tunuloa and Taveuni, Labasa being included on tourism map with Captain Cook Cruises visiting regularly, new jetty for Rabi island and set up of rice farming there, upgrade of Labasa airport etc etc. Hardly ‘forgotten’ but very much on government’s priority list. Good one Graham, I think you have realised that you’re not in the minority but actually the majority. The new Fiji is definately the way forward. The only thing in Fiji now is find ways to motivate the Taukei to work because not all can be politicians. As a taukei i am sick and tired of the itaukei sitting their arse around in the village and crying help me………I am helpless. There need to be a paradigm shift brought about by new legislation. At the moment most Taukei in the village want to be a custodian of the land or culture or qoliqoli……..in the same token they go and buy cassava from the chinese and Indian in the market and also buy fish from them how backwards can you be….! Can someone take this bull by the horn and change this with proper legislation that does not allow and itaukei to sit around in the village like a woman but get up work their land or lease it to someone to put to good use ………..or get a job and pay tax…like everybody else……. I leave it to you……….! That is you thought of the day …! Thats the problem with a’ hand out’ mentality that previous governments with their Affirmatiuve Action policies created – a bunch of lazy people sitting around waiting for the government to step in and solve their problems for them, while their land is covered in jungle and remaining idle. It is exactly the problem that the Aboriginal community in Australia are facing – governments think that throwing money at them the problem will go away. Instead you have them sitting around doing nothing waiting for their payday on the Thursday of every fortnight. In some communities it is so bad that Aboriginal communities have their Kentucky Chicken and French Fries flown to them by charted aircraft they have put in for. The taukei was heading that way with Agro scam and Affirmative Action policies which was nothing more than a pork barrel that encouraged the taukei to sit on their arse and wait for government to come to them to solve their problems. So Frank’s intervention has saved the taukei from falling deeper into apathy. Laziness in the itaukei village is a big problem. The itaukei village is a place where a lazy individual and collective groups do not have to prove themselves to anyone. There is no building code to enforce pride. There is no real law to abide by. You can commit a crime and be forgiven yet you keep commiting it. Where you can actually own land without a title without a clear demarcation. You dont have to pay tax or get a real job. Where the women work so hard without going anywhere. Where the methodist church has been in existence for a long time but there is no change for the better more so for the worse. Something has to be done to change this for the better for the i taukei and all the Kaiviti meaning for all Fijians cause this is totally unfair that 50% of the population do not have work hard and pay tax and then rest have to. If the i taukei work hard like the rest of the other people use their land for economic gain and pay tax ………then only then will Fiji prosper……….if not Fiji will never ever be……..! Fiji can take a leaf out of Samoa where they take so much pride in their villages. Their village system is good…9.00pm the chief blows a whistle and everyone retires to their fales. The big problem with Fiji is YAQONA! The menfolk drink it to the wee hours of the morning then spend all of the next day sleeping it off while the womenfolk take to the gardens to do the planting and harvesting etc. In Samoa yaqona is ony used for ceremonial occassions. They dont use it as a social drink. Your list above is spot on. The problem with the GCC was that they were more concerned with playing politics rather than caring for the welfare of their villages. The problem in Fiji was/is a failure of traditional leadership – sa rui levu na kana waca kei na wele. A majority of the i-taukei population since and prior to the independance were loyal..very loyal subjects to their chiefs and grew up in the belief system that the chiefs will look after them..as long as the subjects loyalty remain….and thus their reliance. The independance, the individuality and to some extent the thought process of each subject was (and is to this very day), controlled by the chiefs and thus was born the system of reliance. And we all know what a majority of chiefs have been doing!! And what happens when the system of reliance is broken…….and individual thinking and self control becomes the norm of the person……yes, take rugby as an example and need I say any more…..the individual brilliance and group performance is known world over….and this can be translated to everyday life of the i-taukei….yes you can. The conversation has to be positive and the truth is that everybody cannot be a government employee, but they can contribute through farming, tourism etc…opportunities are abound. It’s not going to be easy and its not gonna happen tomorrow and that is why we need visionaries to be in the forefront….to guide and have a plan for each of the villages…. We need private sector involvement, not just sitting in hotel board rooms and delivering sermons and papers, but out there in the villages…to be seen by the people…. We need small business involvement in the villages….small business owners going out and talking to youngsters….networking for their teitei products to be bought and sold so they can have cash for clothing etc…..we need to think on these lines and it can be done. Do it in a couple of villages and you will see the flow on effect…….I wasn’t born in a business family but I do run a small business through watching other people and so can the villagers….a business is born on a simple idea…just look around you…. “sorry baiya no achar today”…and she said that she was busy and could not pick mangoes. I said here is an idea….mango season is only a couple of months and you can’t afford not to have achar everyday. With some of your profits, buy some gifts for a couple of village kids (whatever they like within reason) to pick mangoes and show bubu how to make achar and give her some money or buy her clothes….you don’t have to make achar….go upstairs where they sell and have grog…sell them as chasers in the afternoon when not busy…make a couple of rounds every day..make yourself known and tell them where your stall is..and what other things you sell…the idea is that your neighbouring stall and others sell almost the same things, but for you to sell more, you have to make yourself known…. I could see her teary eyes….”baiya nobody ever told me this”…. I left for Australia a couple of days later and didn’t get the opportunity to follow up but I hope I gave her an idea…to be frank it was there with her and all she needed was a spark….little things make a difference in peoples lives and I hope when I next return, I will get an opportunity to meet with her again. I believe that this government is moving in the right direction and we need to support it. As a taukei whose grandfather saw the vision years ago we had done all the things that you wrote chand. We have been blessed and are paid over and over for it. The first thing my grandfather did was left the village. Leased the land and where we grew up and told us never to go back to itaukei village. That small decision as a taukei changed my life forever. He always say you cant change the village get out and stay out if you want to be succesful. The whole Taukei system has to change. no compromise. If the Taukei can play rugby as good then they can be good in business and all other things….and every Fijian will be happy and there will be no more coup..but more hard workers and prospertiy look at singapore. Thanks for the insight mate and good on you and your family…..god bless your grandfather. Bro, that was then… and your grand father was brave enough to make the move…to unchain the shackles of chiefly system but I believe the others may have been cought up…. This is now …and this may be the opportunity for the rest to follow your Grand Fathers footsteps…..I know we cannot change the system for all but that spark may be needed……maybe up their backside to get them moving….I am not condoning the softly softly approach…..
I’m off for now but glad to hear from you again and more please…..
Congratulations on the new name: Grubsheet Feejee. The evolution of the name and its stated focus on matters, Fiji & the Pacific is a logical progression. I have followed the writings and discussions on this site with interest. I am glad to see that these give some balance to the heavily one-sided view on Fiji that the Australian media & politicians normally present to the largely gullible Australian public. Better informed comments on Fiji are always welcomed reading. Let us hope that Fiji as a community will rise above all the verbal sniping that abound in various forums and in cyberspace and presents itself as a prosperous, progressive, just and peaceful country. Achieving such an ideal situation will not be easy; but it can be done with enough enlightened men & women of goodwill.